The bearish engulfing candle outlined in Wednesday’s spot silver market report was confirmed with a vengeance yesterday as commodities in general suffered across the board, with spot silver prices ending the trading session with a wide spread down bar which breached the 14 day moving average early in the trading session. As I suggested earlier in the week, a move lower looked possible for two technical reasons on the silver chart. 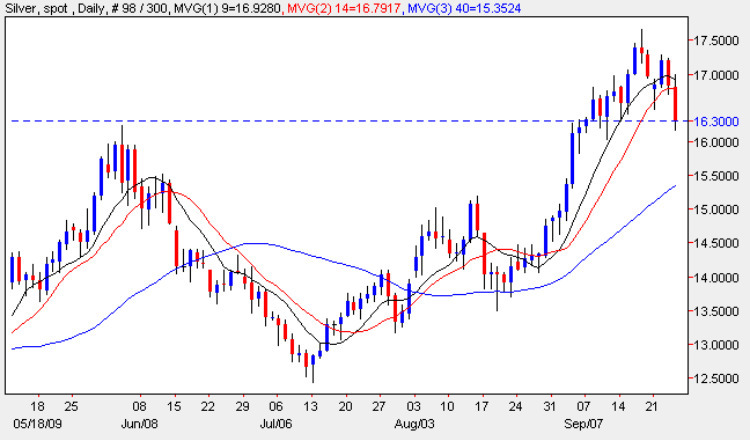 The first of these was the long legged doji candle which had formed on the weekly chart for spot silver, suggesting that silver prices had reached a point of indecision, and could therefore be about to turn lower, which has indeed been the case, and secondly, the stiff resistance level now directly ahead, and which was initially tested on Thursday last week, with the resulting shooting star candle, which was duly confirmed the following day. Clearly the resistance level between $17.50 and $18.50 per ounce are going to provide a significant obstacle to any move higher for spot silver prices in the short term, and the question now of course is how far will silver prices fall, before the upwards momentum is regained once again. The key to this will be the support level now approaching just below the psychological $16 per ounce level. Whilst this is only a minor level, it could provide the necessary platform for spot silver to regroup and mount a move back higher once again, however, should this level fail, then the downwards fall could continue towards the $15.40 region or beyond. However we also have a substantial area of clear water between the 14 day and the 40 day moving average which may also provide some support in due course, but in the meantime we need to wait and see whether the $15.90 level will provide a platform for spot silver to start re-building once again. The short term outlook for spot silver is bearish, the medium term is sideways and the long term is bullish.